Description: A curved Ivory Textrene Shade is complemented beautifully with a diamond-inspired metal wall plate. The exquisite frame and hardware are featured in a Gold finish. 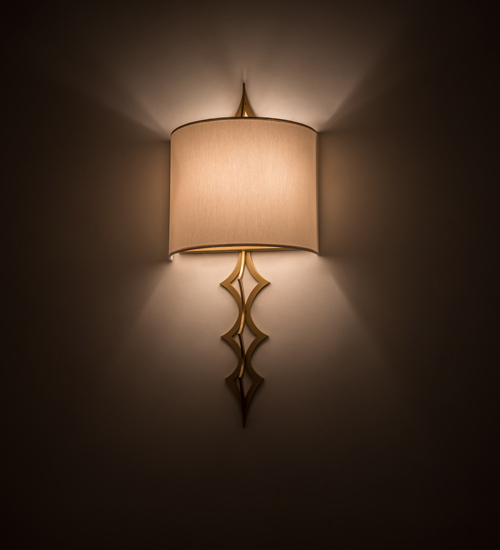 Handmade in our manufacturing facility in Yorkville, New York, this elegant wall sconce is available in custom sizes, styles, and colors. Dimmable energy efficient lamping options are available. The fixture is UL and cUL listed for dry and damp locations however we do not recommend installing it in spaces that experience a large amount of moisture.